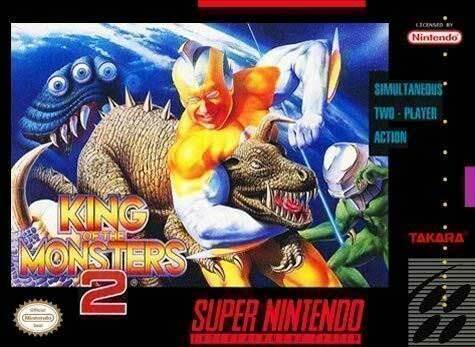 King of Monsters 2 for Super Nintendo is the second title in the series. Alien monsters have returned to try and invade Earth. Super Geon, Atomic Guy, and Cyber Woo must fight to retain control of the planet. Each one has special attacks and powers. Take on monsters that have unique abilities never seen before, including fire breath, aerial spins, and radioactive blasts.